May can be the best month in Scotland, ofetn dry and sunny without ever being the hottest. 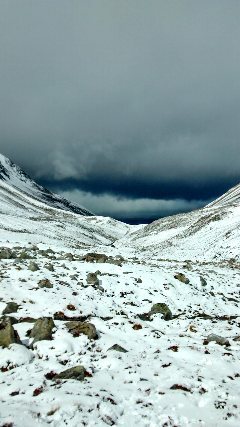 However we have had wetter Mays recently and this year snow is still falling on high ground. In fact I am going to get a late ski this week. 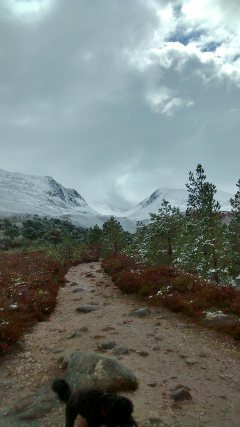 On a recent trip into The National Park I had a nice walk into Lairig Ghru and it got quite snowy at the high point. We could see a storm rolling up behind us from the Spey Valley. We descended back down into Spring! A Green day - blue day? The Scottish Cup is a romantic competition. Even more so if you follow Hibs and their tragic attempts to win back the cup for over 100 years with no joy. Surely a team like Hibs are made for cup competitions; unpredictable, keen to attack, a match for anybody on their day. Alas this competition has produced only heartache now for a long time. My own personal, Hibs Scottish Cup heartaches started in 1979 with a long drive clad in green and white from Inverness to Hampden to watch a goal-less draw with Glasgow Rangers. I say drive, actually a travel sick punctuated journey in the back of an old Ford, down the Great Glen. Replays for finals in those days so not even extra time and penalties! But to the present day and Hibs have been at least getting to the latter stages of SC in recent years. Maybe not a good idea to dwell on details here! However a semi-final against Falkirk was surely worth the trip to Glasgow? Anyway long ( and painful) story Hibs played some lovely football but had no real penetration in final quarter. Time ticked by and on 75 mins Falkirk delivered the sucker punch. Hibs went out 1-0, lots of huffing and puffing....no goals! This time cup final day for the club game with Hawick and Burghmuir competing at the end of a long day of finals for The Final! A large support of a few thousand had travelled up from Hawick, met by an equally impressive Edinburgh crowd of supporters, all fairly well oiled after a sunny day with plenty of refreshment. Amongst the Hawick fans ( very sober), my father in law, whom I was polite enough to accompany on this sporting Saturday! Oh dear two early power-tries to Burghmuir and things were looking ominous and indeed a faster stronger Edinburgh side were well out of sight by half time. A Hawick team playing old-fashioned, fun, attractive rubgy were out done by a modern show of power and clever running lines. That said Hawick held on well in the second half but still came away 55-17 down and once again greens trooped home heads down. The crowd of 10,000 all around us in West Stand, East Stand, majestic and empty in the sun! With a long cold winter behind us Spring is very much here and we can look forward to the excitement of The Open at the 'home of golf' in July. Just ten miles down the road in Crail we can still feel the atmosphere, the village is busy, all the accommodation is full and the bars kept busy. We can't quite heare the roar but the atmosphere is palpable. Now work has started on the grandstands, excitement will start to build. Crail is of course a great place for a base for a golfing trip, two courses in Crail and Kingsbarns, Leven and Lundin Links all close by....before you look at the 10 St Andrews courses! The accommodation sleeps 14 using double beds, 10 if they are used as singles. 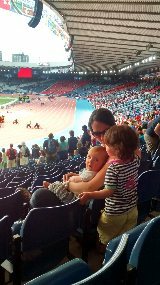 Glasgow did not let us down we went as a family to the atletics on Monday morning, great crowd, great meet. Hampden roared and calum managed a wee nap for 30 mins! Yeah we have tickets and we are making plans for attending our different events. The teams are in the village and it looks like they are getting excited too: tweeting fun photos! 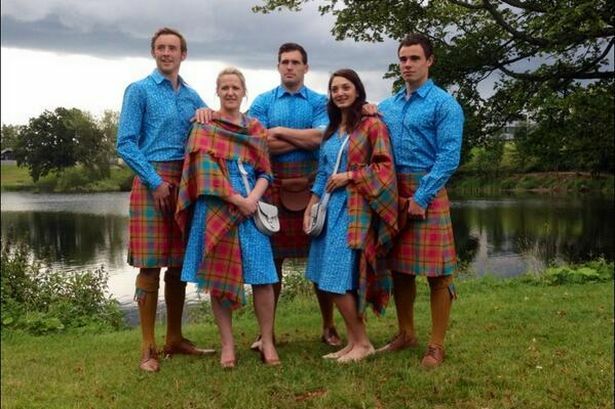 Go Team Scotland - now save your energy! We like it! Where can I get a shirt? Yes we have some tickets and we will be heading to Glasgow ( rugby, athletics, boxing and curry). Crail is maybe not the most obvious choice for games accommodation but nice for a change of scenery after the city. There is no better time than the present with so much going on now or very soon. Looking further into the future, Scotland will decide on her future with the referendum in September but before that we have a look back - 700 years. The 700th anniversary of the Battle of Bannockburn will be celebrated although I prefer that this is a celebration of our hertitage and culture rather than the battle itself. There is loads going on, re-enactments, clan activities, family fun and of course food and drink. 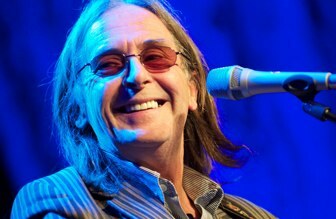 It looks like a really good musical offering too with Dougie Maclean and King Creosote;two of my personal favourites. Lets have some fun and look back for a while. There are some great long distance walks in Scotland the most famous being the West Highland Way from Glasgow ( Milganvie) to Ft William through some amazing scenery. This was extended to Inverness some years ago under the Great Glen Way banner,Nessie spotting is an added extra! The Fife Coastal Path has proven popular over the last ten years, I particularly like Crail to St Andrews, the approach to The Old Grey Toon is wonderful. FCP goes right passed the door at Caiplie, using the 95 bus you can do loads of great walking from the house as the bus route runs parallel to the path along the coast, so you are never more than a mile from the bus route for getting home then starting off again in the same place. A new path has arrived marking the 100th anniversary of the conservationist John Muirs death, the John Muir Way opened in April. The 134-mile-long trail runs coast-to-coast from Muir's hometown of Dunbar all the way to Loch Lomond, passing by castles, hills and canals along the way. Walking the length of the Way will take eight to 12 days (or four to six by bike). You could of course turn North on TWHW at Loch Lomond and on to Inverness....be brave! We are all guilty from time to time of thinking that our own little world and life is the centre of the universe right? Surely this year in Scotland we are justified to feel like we really are? In a series of blogs we will explore 10tatsic events and activities that should attract you to Scotland or make sure you get out and make the most of your country. 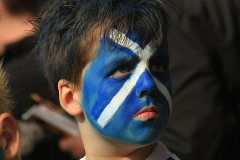 2014 is a Homecoming Year - the country welcomes home it's diasopora or just folk who like Scotland. This programme itself brings together a vast array of brilliant events under a number of themes.